Over the past few million years, the Earth's climate has swung repeatedly between ice ages and warm interglacial periods. Twenty thousand years ago, an ice sheet covered Canada, reaching as far south as Seattle, Iowa and New York City. More than a mile thick, the ice sheet, should it return, would tower over and crush to dust the tallest buildings in its path. A 400,000 year record of temperature is preserved in the Antarctic ice sheet, which, except for coastal fringes, escaped melting even in the warmest interglacial periods. Water isotopes (deuterium and 18O) in the annual snow layers reveal the temperature at which the snow formed. This record (Figure 2) suggests that the present interglacial period (the Holocene), now about 12,000 years old, is already long of tooth. Absent humans, the Earth might "soon" (in thousands of years) be headed into its next ice age. Figure 2. 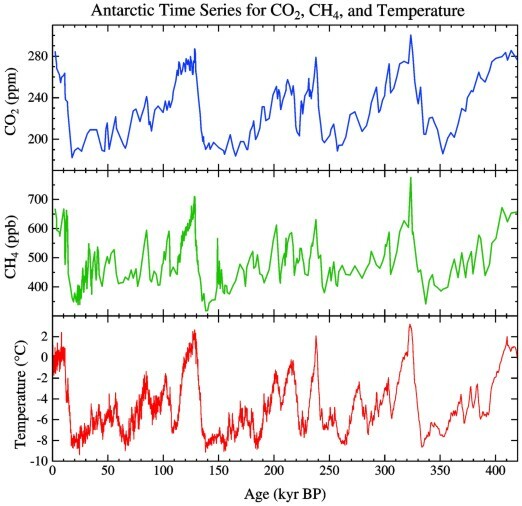 Record of atmospheric temperature, CO2 and CH4 extracted from Antarctic ice core (Reference 2f). The next ice age will never come, however, unless humans desert the planet. As we shall see, the small forces that drove millennial climate changes are now overwhelmed by human forcings. A small fraction of the greenhouse gases that civilization emits is sufficient to avert global cooling. The problem is now the opposite: human forcings are driving the planet toward a warmer climate. Our best guide for how much the Earth's climate will change is provided by the record of how the Earth responded in the past to natural forcings. The natural millennial climate changes are associated with slow variations of the Earth's orbit induced by gravitational torque by other planets, mainly Jupiter and Saturn (because they are so heavy) and Venus (because it comes so close). These torques cause the Earth's spin axis, now tilted 23° from perpendicular to the plane of the Earth's orbit, to wobble more than one degree (about 40,000 year periodicity); the season at which the Earth is closest to the sun to move slowly through the year (about 20,000 year periodicity); and the Earth's orbit to vary from near circular to elliptical with as much as 7% elongation (no regular periodicity, but large changes on time scales of 100,000 years and longer). These perturbations hardly affect the annual mean solar energy striking the Earth, but they alter the geographical and seasonal distribution of insolation as much as 1020%. The insolation changes, over long periods, affect the building and melting of ice sheets. Today, for example, the Earth is nearest the sun in January and farthest away in July. This orbital configuration increases winter atmospheric moisture and snowfall and slows summer melting in the Northern Hemisphere, thus, other things being equal, favoring buildup of glaciers. Insolation and climate changes also affect uptake and release of CO2 and CH4 by plants, soil and the ocean, as shown by changes in atmospheric CO2 and CH4 that are nearly synchronous with the climate changes (Figure 2). When the temperature, CO2 and CH4 curves are carefully compared, it is found that temperature changes usually precede CO2 and CH4 changes by 5001000 years on average. This indicates that climate change causes CO2 and CH4 changes. However, these greenhouse gas changes are a positive feedback that contributes to the large magnitude of the climate swings. Climatologists are still developing a quantitative understanding of the mechanisms by which the ocean and land release CO2 and CH4 as the Earth warms, but the paleoclimate data are already a goldmine of information. The most critical insight provided by the ice age climate swings is an empirical measure of climate sensitivity. The composition of the ice age atmosphere is known precisely from air bubbles trapped as the Antarctic and Greenland ice sheets and numerous mountain glaciers built up from annual snowfall. The geographical distributions of the ice sheets, vegetation cover, and coastlines during the ice age are well mapped. From these data, we know that the change in climate forcing between the ice age and today was about 6 1/2 W/m2 (Figure 3). This forcing maintains a global temperature difference of 5 °C, implying a climate sensitivity of 3/4 ± 1/4 °C per W/m2. Although climate models yield a similar climate sensitivity, the empirical result is more precise and reliable because it includes all the processes operating in the real world, even those we have not yet been smart enough to include in the models. The paleodata provide another important insight. Changes in the Earth's orbit are an instigator of climate change, but they operate by altering atmosphere and surface properties and thus the planetary energy balance. These atmosphere and surface properties are now influenced more by humans than by our planet's orbital variations. Greenhouse gases are increasing today and glaciers and ice sheets are melting back. The old maxim, that the Earth is heading toward a new ice age, has been rendered void by the power of modern technology. "Last winter was so cold! I don't notice any global warming!" Global warming is ubiquitous, but its magnitude so far is only about 0.6 °C (1 °F). Day-to-day weather fluctuations are about 6 °C (10 °F). Even averaged over a season, this natural (year-to-year) variability is about 1 1/4 °C (2 °F), so global warming does not make every season warmer than it was a few decades ago. However, global warming already makes the probability of a warmer than "normal" season about 60%, rather than the 30% that prevailed in 19501980 (Plate XV in Reference 13). "I read that satellites have measured global cooling, not warming." That was the story a few years ago, but as the satellite record has lengthened and has been studied more carefully, it has shifted to indicate warming. The discrepancy with surface measurements is disappearing. The primary issue now is: "How fast is the warming?" "The surface warming is mainly urban 'heat island' effects near weather stations." Not so. As predicted, the largest warming is found in remote regions such as central Asia and Alaska. The largest areas of surface warming are over the ocean, far from urban locations (see maps at http://www.giss.nasa.gov/data/update/gistemp). Temperature profiles in the solid earth, at hundreds of boreholes around the world, imply a warming of continental surfaces of between 0.5 and 1 °C over the past century. "The warming of the past century is just a natural 'rebound' from the 'little ice age'." Any rebound from the European little ice age, which peaked in 16501750, would have been largely complete by the 20th century. Indeed, the natural long-term climate trend is toward a colder climate. "Isn't human-made global warming saving us from the next ice age?" Yes, but the gases that we have added to the atmosphere are already far more than needed for that purpose. "Climate variations are mainly due to solar variability." The sun does flicker and the 'little ice age' may have been caused, at least in part, by reduced solar output. Best estimates are that the sun contributed about one quarter of global warming between 1850 and 2000. Climate forcing by greenhouse gases is now larger than that by the sun, and the greenhouse forcing is increasing monotonically, whereas no significant long-term trend is expected for the sun. The sun may contribute to future climate change, but it is no longer the dominant player. "Global warming will be negligible if the 'iris effect,' suggested by Richard Lindzen, is valid." This proposed negative climate feedback (in which it is supposed that tropical clouds adjust to allow more heat radiation to escape to space when the Earth gets warmer) has been discredited in specific tests against in situ and satellite data. More generally, any feedbacks that exist in the real world are included in the empirical measures of climate sensitivity provided by the history of the Earth. This history shows that the Earth's climate is sensitive to forcings, with a sensitivity similar to that of climate models. The largest change in climate forcings in recent centuries has been caused by human-made greenhouse gases (see Box 3). These gases absorb the Earth's infrared (heat) radiation. Because they make the atmosphere more opaque in the infrared region, the Earth's radiation to space emerges from a higher level in the atmosphere, where it is colder. The energy radiated to space is thus reduced, causing a temporary planetary energy imbalance, with the Earth absorbing more energy from the sun than it radiates to space. Thus the Earth gradually warms. Because of the large heat capacity of the oceans, the Earth requires about a century to return most of the way to equilibrium; however, more forcings may be added before this equilibrium is achieved. The single most important human-made greenhouse gas is CO2, which comes mainly from burning of fossil fuels (coal, oil and gas) (see Box 3). However, the combined effect of the other human-made gases is comparable to that of CO2. These other gases, especially tropospheric ozone (O3) and its precursors, including methane (CH4), are ingredients in atmospheric smog that damage human health and reduce agricultural productivity. Aerosols (fine particles in the air) are, besides greenhouse gases, the other main human-made climate forcing. Aerosols cause a more complex climate forcing than that caused by greenhouse gases. Some aerosols, such as sulfates arising from sulfur in fossil fuels, are highly reflective (white) and thus reduce solar heating of the Earth. However, black carbon (soot), a product of incomplete combustion of fossil fuels, biofuels and outdoor biomass burning, absorbs sunlight and thus heats the atmosphere. The magnitude of the climate forcing due to aerosols is uncertain by at least 50%, in part because aerosol amounts are not well measured. In addition, the black carbon effect is complex. In regions with heavy soot, such as India and China, sunlight at the surface is reduced, causing local surface cooling. However, the heating of the air at higher levels results in net global surface warming through its influence on atmospheric stability and cloud cover. These effects must be computed with global climate models, and their magnitude differs from one model to another. Aerosols also cause an indirect climate forcing by altering the properties of cloud drops. Human-made aerosols increase the number of condensation nuclei for cloud drops, thus causing the average size of the cloud drops to be smaller. The larger number of smaller drops makes the clouds slightly brighter. Smaller drops also make it more difficult for the clouds to produce rain, thus increasing average cloud lifetime. Brighter, long-lived clouds reduce the amount of sunlight absorbed by the Earth, so the indirect effect of aerosols is a negative forcing that causes cooling. Other human-made climate forcings include replacement of forests by cropland. Forests are dark even with snow on the ground, so their removal reduces solar heating. Natural forcings, such as volcanic eruptions and fluctuations in the sun's brightness, probably have little trend on a time scale of 1000 years. However, evidence of a small solar brightening over the past 150 years implies a climate forcing of a few tenths of 1 W/m2. The net value of the forcings added since 1850 is 1.6 ± 1.0 W/m2. Despite the large uncertainties, there is evidence to support this estimate. One piece of evidence is the close agreement of observed global temperature during the past several decades with climate models driven by these forcings. More fundamentally, the observed heat gain by the world ocean in the past 50 years is consistent with the estimated net climate forcing, as discussed below. Box 3: Climate forcing agents in the industrial era (18502000) (W/m2). Error bars are partly subjective 1 σ (standard deviation) uncertainties. Increases in well-mixed greenhouse gases (excluding O3) are known accurately from in situ observations and bubbles of air trapped in ice sheets. For example, the increase of CO2 from 285 parts per million (ppm) in 1850 to 368 ppm in 2000 is accurate within about 5 ppm. The conversion of this gas change to a climate forcing (1.4 W/m2), from calculation of the infrared opacity, adds about 10% to the uncertainty. The increase in CH4 concentration since 1850, and its effect on stratospheric H2O and tropospheric O3, causes a climate forcing half as large as that caused by CO2. Principal anthropogenic sources of CH4 are landfills, coal mining, leaky natural gas lines, increasing ruminant population, rice cultivation, and anaerobic waste management lagoons. In the last decade, the growth rate of CH4 has slowed, suggesting that the growth of sources is slowing. Tropospheric O3 is increasing partly because CH4 is increasing, but the primary cause is other human-made emissions, especially carbon monoxide, nitrogen oxides, and volatile organic compounds. Air quality regulations in the U.S. and Europe have reduced O3 precursor emissions in recent years, but not quite enough to balance increased emissions in the developing world. Black carbon (soot), a product of incomplete combustion, can be seen in the exhaust of diesel-fueled trucks and buses. It is also produced by combustion of biofuels and burning of biomass. 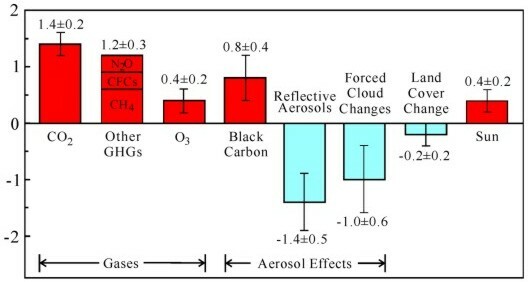 Black carbon aerosols are not well measured, but their climate forcing is estimated from wide-spread multispectral measurements of total aerosol absorption. The estimated forcing includes the effect of soot in reducing the reflectance of snow and ice. The reflective human-made aerosols are mainly sulfates, nitrates, organic carbon, and soil dust. Sources include fossil fuel burning and agricultural activities. Sources of the abundant sulfates are known reasonably well, but the 1 σ uncertainty in the net forcing by reflective aerosols is at least 35%. The indirect effects of aerosols on cloud properties are difficult to compute accurately, but recent satellite measurements of the correlation of aerosol and cloud properties are consistent with the estimated net forcing of 1 W/m2. The uncertainty is at least 50%. Land cover effects are estimated in a global climate model by replacing crops with natural vegetation. The primary effect is in snowy regions, where snow-covered fields are brighter than forests. Long-term measurements of sunspots and faculae on the sun, and their empirical relationship with solar brightness during the satellite era, suggest a small solar brightening over the past 150 years. The estimated climate forcing, including associated ozone change, is a few tenths of 1 W/m2.